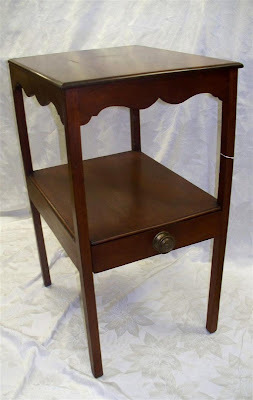 Weekend Historical Happenings: 2/16/13 - 2/17/13 ~ The History Girl! 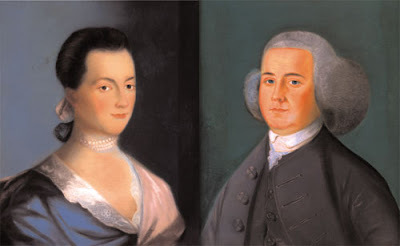 In celebration of Valentine's Day, the Metlar-Bodine House Museum presents "John & Abigail Adams: A Love Story" on Saturday. Set against the backdrop of The American Revolution, political intrigue and the building of a new, fragile and fractious government, the enduring love and abiding friendship between John and Abigail Adams is one of the great love stories of American history. Historian Glenn W. LeBoeuf, will talk about their courtship, marriage, family life and the friendship that persevered through many trials on February 16th, at 2pm (rescheduled from February 9th due to the snowstorm). Mr. LeBoeuf received his degree in history from Monmouth University, taught social studies for many years, and for over 25 years has been a sought-after lecturer for historical societies, civic groups, library associations and colleges. In addition, he was active in Civil War Reenacting, having participated in the films Glory and Gettysburg. He is a life-long resident of New Jersey. Seating is limited. Reservations must be received by February 14th. Refreshments will be served after the program and the museum's gift shop will be open. Cost $15 per person. For reservations and directions, call 732-463-8363. The Metlar-Bodine House Museum is located at 1281 River Road, Piscataway, NJ. 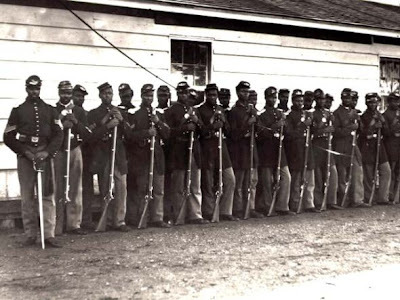 In celebration of Black History month and the nation's commemoration of the sesquicentennial of the Civil War, the Westfield Historical Society will be hosting an exhibit presented by Ethel M. Washington entitled "Union County - Black Soldiers and Sailors in the Civil War." On Saturday at 1:00 pm, an introductory gallery talk will be given by Ms. Washington to kick off the exhibit, which will run through March 2013. April 12, 2011 marked the beginning of the nation's four-year (2011-2015) commemoration of the sesquicentennial of the Civil War and the Emancipation of enslaved Americans. The exhibit will showcase people of African American descent (Blacks and Mulatttos) from the "West Fields" and surrounding Union county who were actively engaged in the Civil War and the fight for their freedom. On display are portraits of Union County Black and Mulatto soldiers and sailors that enlisted in the regiments of the United States Colored Troops (USCT), as well as in white regiments raised in Union County. Ms. Washington has spent most of her career in various cultural institutions, including the Newark Museum, Montclair Art Museum and the Cooper-Hewitt, as well as the National Design Museum, and Smithsonian Institution in New York City. Ethel served for many years as commissioner on the Plainfield Cultural and Heritage Commission. She was involved in a one-year oral history project funded by the Corporation for Public Broadcasting in order to get oral histories from 1,750 African-American families which have since been archived in the Library of Congress. She is a trustee on several boards including founding Vice Chair of the New Jersey African-American Cultural Heritage Foundation, The Old First Historic Trust Board- First Presbyterian Church of Elizabeth, The New Jersey State Historical Records Advisory Board, and the Advocates for New Jersey History Board. Ethel currently serves as History Programs Coordinator, Union County Office of Cultural Heritage Affairs, Department of Parks and Community Renewal. Crafts and Antiques in Winter: The region's most sought-after antique dealers and craftspeople come together for a two-day show featuring an array of handmade items, country antiques, glassware, silver, furniture and more. Saturday and Sunday from 10:00 am to 4:00 pm at the Cape May Convention Hall, Beach Avenue in Cape May. Admission $2. Sponsored by the Mid-Atlantic Center for the Arts & Humanities (MAC). For more information or to purchase tickets, call 609-884-5404 or 800-275-4278 or visit www.capemaymac.org. Ghosts of Cape May Trolley Tour: Take this spine-tingling, 45-minute evening trolley ride through the streets of Cape May with a guide who relates the paranormal findings of Ghost Writer Craig McManus. Offered Saturday at 7:30 pm and 8:30 pm and Sunday at 7:00 pm and 8:00 pm. Admission: $10 for adults, $7 for children (ages 3-12). Sponsored by the Mid-Atlantic Center for the Arts & Humanities (MAC). For more information, call 609-884-5404 or 800-275-4278 or visit www.capemaymac.org. Panel Discussion on the Carriage House Gallery Exhibit: "Celebrating Community Service: Black Fraternal, Social and Civic Organizations of Cape May County." Join representatives from the Center for Community Arts (CCA) and the local community to discuss the current Carriage House Gallery exhibit, which explores the significance of black fraternal, social and civic organizations in African-American social life and focus on those relevant to Cape May County. Sunday at 4:00 pm. Co-sponsored by the Center for Community Arts (CCA) and the Mid-Atlantic Center for the Arts & Humanities (MAC). For more information, call 609-884-5404 or 800-275-4278 or visit www.capemaymac.org. The Pascack Historical Society (PHS) hopes to expand the knowledge of amateur antique furniture fans when it presents the first of a series of displays and lectures called "How to Speak Antique" on Sunday from 1:00 - 4:00 pm, at its barrier free museum, 19 Ridge Avenue, Park Ridge. Free admission. PHS Trustee Robert Mathez, an expert on the restoration and conservation of antique furniture, will speak at 1:30 pm. His presentation will focus on the techniques used to identify various "styles of furniture" from The Seventeenth Century ("Pilgrim Country"- 1630-1690) through Modern (1940-1970). A Westwood resident, Mathez is president of Robert Mathez Interiors, and the Curator of Furniture at the not-for-profit museum. Future lectures in the series with include furniture "forms" and "woods." Visitors will be able to view six pieces of furniture that represents various styles and periods, including: "In the Style of the Seventeenth Century" ladderback chair a American Queen Anne Style tilt top candlestand, a Georgian Style washstand, a Federal Style "Fancy" chair, an American Empire Style washstand commode and a Victorian Style upholstered armchair. Attendees will receive a complimentary copy of a brand new sixteen page antique furniture guide booklet, published by the Pascack Historical Society, highlighting the furniture on display and containing information about different periods of furniture styles. An in depth question and answer period will follow the talk. Attendees are encouraged to bring small pieces of furniture, or photographs of their personal furniture, for identification and discussion. No values or formal written appraisals will be given. Complimentary coffee and cake will be served. Children are welcome if accompanied by an adult. For further information, questions or directions call 201-573-0307 or visit www.pascackhistoricalsociety.org. Join the Burlington County Historian Joe Laufer on Sunday from 2:00 - 4:00 pm for "Burlington County Trivia." Learn about the fun facts and oddities that Joe Laufer has uncovered in his years of research on historical topics. Q and A and light refreshments follow the program. The cost is $5 per person. The program will be held at the Corson Poley Center at the Burlington County Historical Society, 454 Lawrence Street, Burlington, NJ 08016. For more information please call 609-386-4773 or e-mail burlcohistsoc@verizon.net. On Sunday, Macculloch Hall Historical Museum welcomes museum member and decorative arts collector Ken Miller for a brief examination of the early silver industry in the Colonies and newly born United States, focused on the significant changes within this one craft. It was not just taste and technique that changed during this period, nor was the American political revolution the only upheaval -- in fact social and commercial life went through its own revolution during these years and can be witnessed through the stories of early America's silversmiths. Ken Miller served as a Naval flight officer, and then pursued a career in finance before retiring in 2003. He is currently focused on volunteerism. He is a gubernatorial appointee to the Board of the New Jersey Historic Trust, serves as chair of Morristown New Jersey's Historic Preservation Commission, is a trustee and treasurer of the Theta Xi foundation, and treasurer of the Morristown Library Foundation and his local church. Ken's passion for history, architectural design, and the decorative arts have been expressed through collecting, study, and preservation. 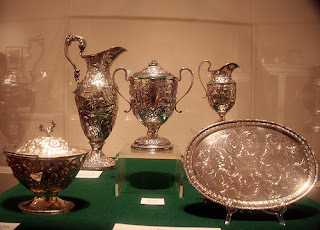 His collecting interest is focused on early American silver, maritime, and automotive related subjects. Ken is also actively working on the restoration of his National Historic Landmark residence. Tickets for Sunday's program will go on sale at 1:00 pm on the day of the program, no advance sales. The presentation begins at 4:30 pm. House tours (regular admission applies) take place throughout the afternoon and the last tour leaves at 3:00 pm. The upstairs galleries will remain open until 4:30 pm, with the "A Fine Collection" exhibit closing at 3:00 pm in preparation for the program. Tickets to hear the speaker are Adults $8; Seniors & Students $6; Children 6 - 12 $4. Members and children under 5 are free. Speaker tickets include admission to take part in a house tour through the period rooms of the Museum for visitors who sign up for a tour during the afternoon. Visitors can also enjoy the upstairs gallery exhibit "Thomas Nast: President Maker and Campaign Breaker," with more than 20 examples of presidential campaign images from the late 19th century. The exhibit illustrates the six presidential campaigns from 1864 through 1884. The museum is open to tour the house and view exhibits on Wednesdays, Thursdays and Sundays from 1:00 - 4:00 pm. Adults $8; Seniors & Students $6; Children 6 - 12 $4. Members and children under 5 are free. The last tickets for admission are sold at 3:00 pm. Call 973-538-2404 ext. 10 or visit www.maccullochhall.org. Macculloch Hall Historical Museum is located at 45 Macculloch Avenue, Morristown. On Sunday, the Historic Village at Allaire kicks off its first event of the year with George Washington’s Birthday Celebration from 1:00 - 4:00 pm! Join the Allaire Villagers for a day of celebration! At 1:00 p.m., the villagers of James P. Allaire's Howell Iron Works Company invite you to join them in the Historic Chapel for an 1830s-style Patriotic and Commemorative service in honor of General Washington! Featuring patriotic orations, speeches, and commemorative poetry of the period, the service pays tribute to the young nation's beloved first president. The service will be followed by a procession through the village led by the Howell Iron Works Militia. Upon arriving at Mr. Allaire's mansion, visitors may take a tour of the building and sample a piece of birthday cake in honor of George Washington. This event is FREE. The Historic Village at Allaire is located in Allaire State Park at 4263 Atlantic Avenue, Farmingdale, New Jersey 07727. Call 732-919-3500 for more information or visit www.allairevillage.org. The Jacobus Vanderveer House will be open for tours from 10:00 am - 4:00 pm. The day will feature a reenactor of General Henry Knox, who will explain his role in the history of the American Revolution and the Pluckemin Academy. At 3:30 pm, there will be a presentation on the Pluckemin Cantonment and a preview of the Digital Virtual Cantonment. The cantonment was located where the Hills of Bedminster residential community is sited today. Dr. John Seidel and Dr. Stewart Bruce, professors at Washington College, are creating a virtual 3D model of the cantonment, which they will preview in this presentation. The Jacobus Vanderveer House is located at 955 Route 202/206 South, Bedminster, NJ 07921. For more information visit www.jvanderveerhouse.com.